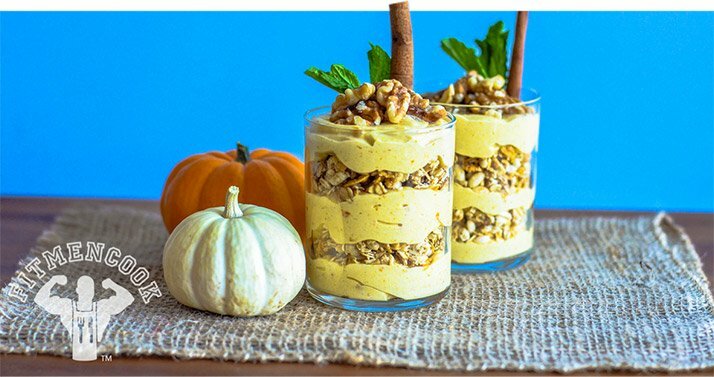 Add some flair to your dessert, or your breakfast, with this ridiculously good, muscle-building pumpkin parfait! The leaves are changing, temperatures are dropping, and everywhere you go you see bright orange orbs. "Oh my gourd," you say, "it's time for pumpkin!" But there's more to pumpkin than just pie. This year, kick things up a notch with a pudding creation that will send your Jell-O packets packing. Snack on this parfait as a midday meal or indulgent breakfast. Kevin Alexander is a fitness enthusiast and creator of ''FitMenCook''. He is based in Dallas, TX.